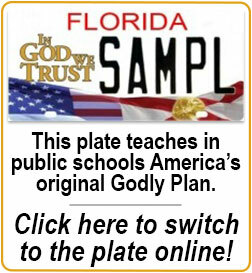 We thought up and are the sponsoring organization of the In God We Trust motor vehicle specialty license plate in Florida. Your faith-based charitable donations received from purchases and renewals of the plate are used for God's work through this faith-based organization. The In God We Trust Foundation, Inc. is based in Tampa, Florida and works throughout God’s world. We are a 501(c)(3) public purposes charity run by purpose-driven people who believe life is about doing what God intends us to do. IGWT has a competent and skilled Board of Directors and uses a larger advisory council of knowledgeable groups in our subject areas to identify the most effective grant disbursements. We direct the faith-based donations we receive in a manner compatible with the faith-based donative intent of those supporting this organization. We also receive funding from direct donations by people like you who believe in our mission, state employees giving through their state charitable campaigns, federal workers, contractors and retirees giving though Combined Federal Campaign, and employees in businesses participating in workplace giving. The United Way is a closed shop for a discrete number of groups and we neither participate in it nor receive money from it. Our articles and IRC 501(c)(3) approval provide that IGWT is organized exclusively for charitable, religious, educational and scientific purposes under section 501(c)(3) of the Internal Revenue Code or corresponding section of any future tax code, and conducting all lawful business related to those activities and the management and distribution of the funds and proceeds related to those activities.